The Penhaligon’s counter at Bloomingdales, South Coast Plaza. You know those stylish girls that wear the “must have” scent of the season? The ones that display the latest chic perfume bottle on their dresser? You must have met at least one trendy girl that smells like she’s just leapt out from one of the scented flaps inside Vogue? Well, I’m not one of them. Don’t get me wrong I’m not a fan of powdery grandma perfumes (sorry Numero 5, I love all the other Chanel scents) but I like to wear something that not so available. I prefer not to smell like the hordes of glam women in the ladies bathroom at the hippest bar in town, even if they do smell nice. And I will hunt high and low to find my scent, the one that captures my imagination as well as my nose. 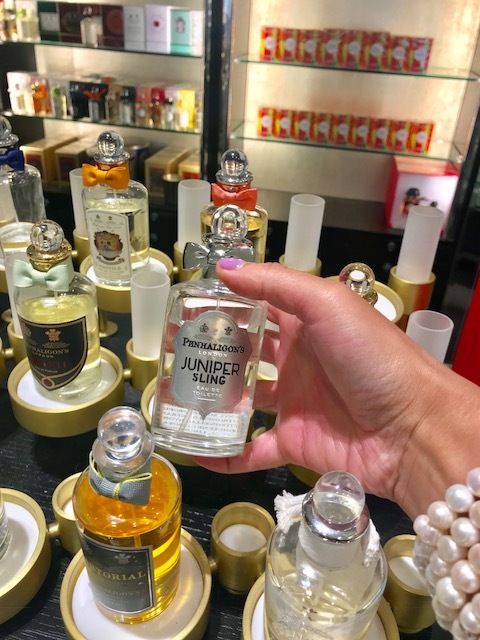 Penhaligons and I go way back to my college days when I was a Saturday “Harrods Perfume Girl.” I used to pass their counter on my way back from my lunch break and spray on Bluebell. The Penhaligon’s counter was out of sight. It was closer to the toiletries department where the talcum powders, soaps and body lotions were. They were never really part of the top selling perfumes showcased in the front where we were. Considering I had a choice of any perfume in the world (Harrods has them all), I have no idea why I liked this simple English scent. Even though I was selling the big brand name perfumes (which I enjoyed) when off duty, I liked to wear the lesser known ones. I still do. There’s something unique about the fragrances that not everyone knows, the ones with a rich heritage. They offer longevity. If you can find one that meets the demand of our modern aesthetics but with a brand that has history, then you have it all. In this case the English Penhaligon’s brand was established in 1870 in London. Mr. Penhaligon started as a barber, opened a hairdressing salon where he made his own products and eventually made his way to the royal court. Juniper Sling by Penhaligon’s is the perfect blend of spicy and sweet fresh Spring scent. And the bottle? Well, it’s a divine classic, still modern but with an old world charm. 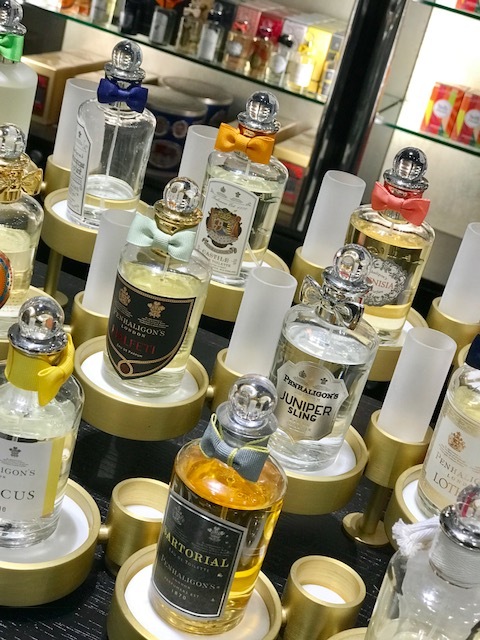 Fast forward a few decades and as I pass by the perfume counter at Bloomingdales recently, my eyes fell on the Penhaligon’s counter. It felt like the oddest thing to come across the apothecary shaped perfume bottles sitting pretty in a row, far away from when we first met and locked noses. What’s Penhaligon’s doing in Orange County I thought? They didn’t have Bluebell (which you can buy online) but after sniffing almost all of the bottles (some were too literal for me), I fell in love with Juniper Sling. The patient sales person described it to me as a midday cocktail. As soon as he turned around to help someone else, I took the bottle and drenched myself with the fragrance. I didn’t want him to see how enamored I was with it, so early on. It was embarrassing how intoxicated I felt. But I was hooked. The fact that I later found out it’s listed under mens fragrances didn’t phase me the least. In fact I understood why I had taken a liking to it. Inspired perhaps by a real Gin Sling cocktail, this scent gave me the feeling of instant joy and energy. It’s fresh, spicy and sweet but not too light, with notes of juniper berry there’s something alluring about it. Wearing it gave me a rush, an exuberant feeling of happiness. And who doesn’t need a little afternoon pick me up? I certainly do. Salut! Of all the malls in, in all the cities, Max Mara, have opened their onlyWeekend store in the U.S. at South Coast Plaza. 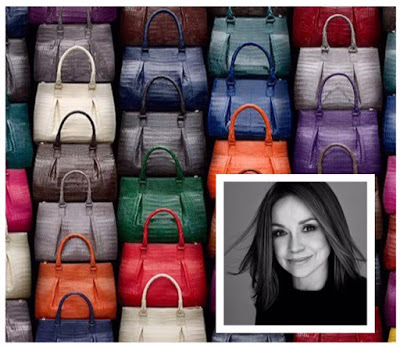 The quintessential Italian brand worn by sophisticated women around the world picked Orange County as their launching pad. 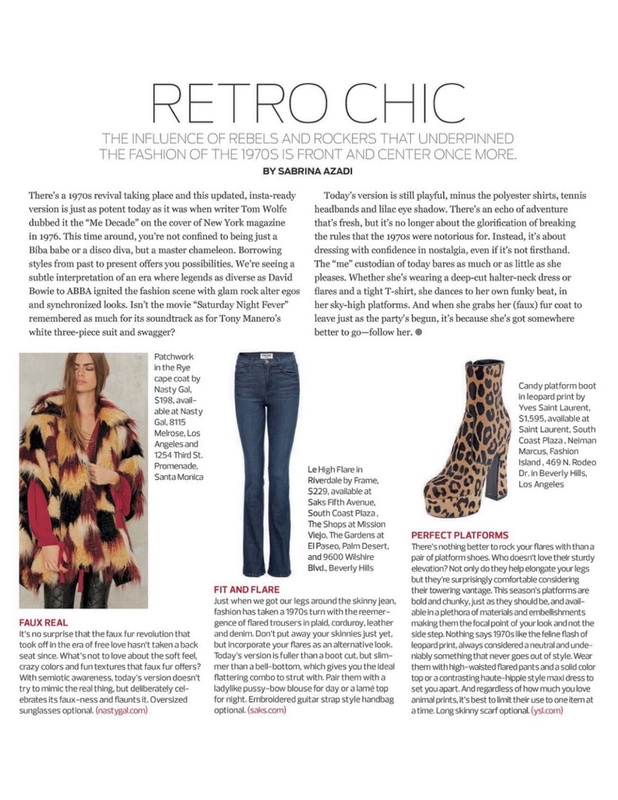 Without sounding ungrateful, there are down sides to any place, even a fabulous place like Orange County but SCP (which sounds very much like another fashion icon SJP) has got to be a bonus, the icing on the cake. And speaking of cakes, this bag at Weekend stopped me in my tracks. It’s aptly called the “Pasticcino” Italian for small pastry. When the well-meaning sales assistant said it was inspired by cupcakes, I may have, unintentionally, rolled my eyes. Italians eating cupcakes? Cupcakes and Cappuccinos? Whatever next? I’d like to think it was inspired by one of the tiny delicious Italian pastries that you first admire in the shop window of a bakery/coffee shop, along a cobblestone street far from the madding crowd. It’s in a part of town that tour guides seldom frequent. You’ll sit at a small table, order an espresso and point to the pasticcino in the window. When it’s presented, you pop it in your mouth and wash it down with bitter espresso. And then, decide to taste 100 more. But Weekend isn’t all about handbags. They’re an entire look, a lifestyle. 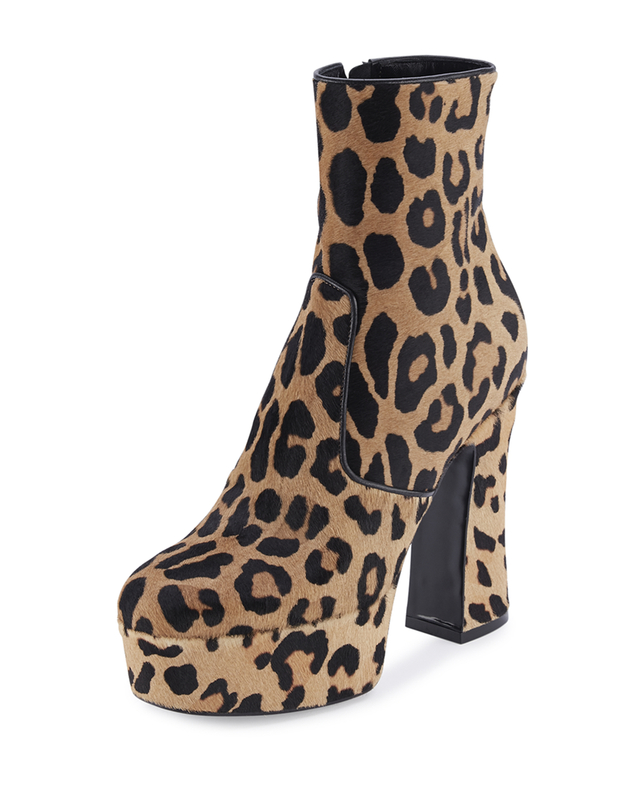 They’re the off duty version of the career driven, Max Mara lady, which means this is what she wears on the weekend—for leisure. The Dowager Countess of Grantham (Downton Abbey fans this one’s for you) may not have approved. “Weekend? What’s a Weekend?” she, once asked. Aristocrats didn’t have jobs, therefore the concept of the weekend was for ordinary, common folk, like me. Max Mara would have a field day with me. If they only knew I hardly get out of my PJs on the weekend. Perhaps I’m not their target clientele, but I was inspired by what people with proper jobs get to wear on the weekend. I’ll be happy to wear anything in their store. Monday to Friday and through the weekend. And coming back to the yummy bag. If it was inspired by cupcakes, someone please inform House of Sillage. I prefer my own version of the truth. Now, how about a nice cup of tea? Love..hate..love. That’s fashion for you. 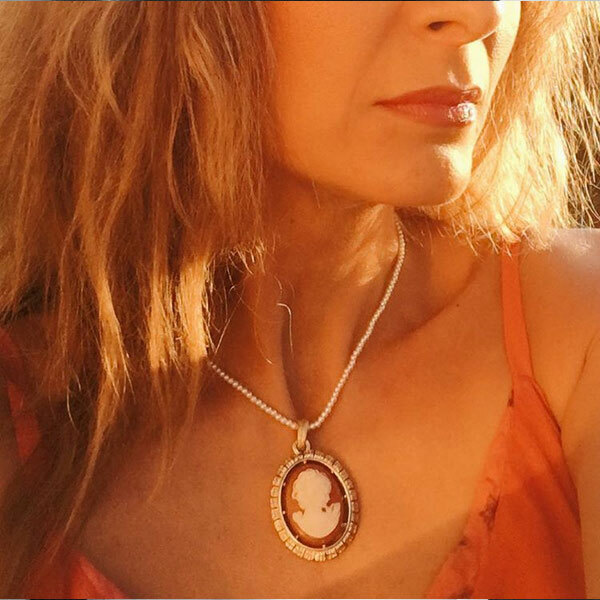 Sums up my relationship with my vintage Cameo pendant that I’ve had for as long as I can remember and currently in love with, all over again. Queen Victoria made it popular back in the day. She had a thing for them, as did Napoleon who loved them so much he wore one on his wedding day. The profile of a lone woman, carved on shell, coral or agate in classic dress with tousled curls is as elusive as ever. 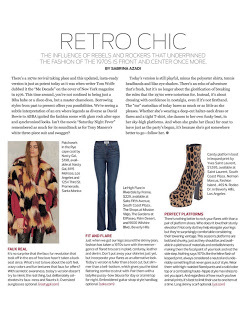 What goes around, comes around, even in fashion and I predict they will be making a major cameo appearance! Just as the kitchen is the heart of a home, the beauty department is at the heart of a department store. And that’s where the two worlds of Clive Christian collide. Known for creating bespoke interiors and furniture, the British designer was one of the first to bring the crystal chandelier into the kitchen. So it’s no surprise that his namesake perfume company is synonymous with using the finest, exotic ingredients to create exceptional perfumes, showcased in the most luxurious bottles and flacons. 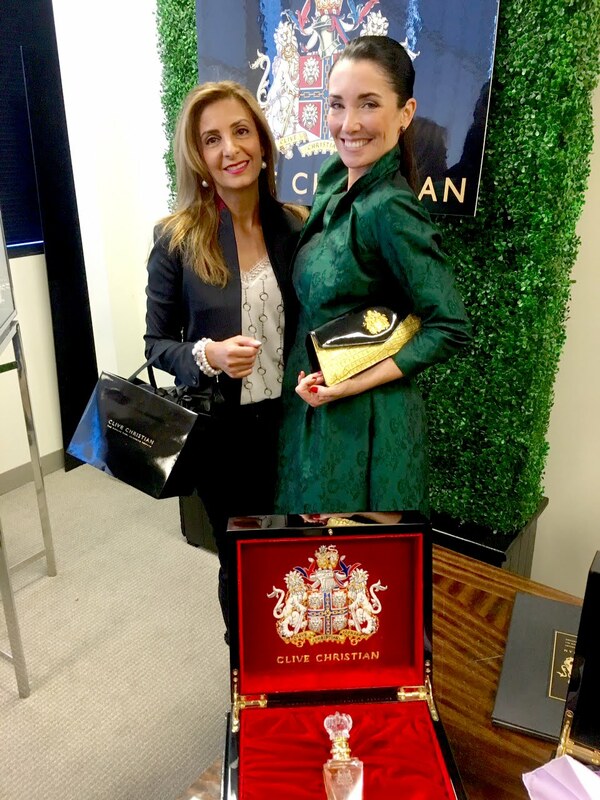 Victoria Christian daughter of Clive Christian holding the Nº1 perfume case at Neiman Marcus, Fashion Island. Nº1 is known as “the most expensive perfume in the world.” Nº1 perfume spray for women by Clive Christian, 1.6oz, $865 available at Neiman Marcus. Photo by Sabrina Azadi. 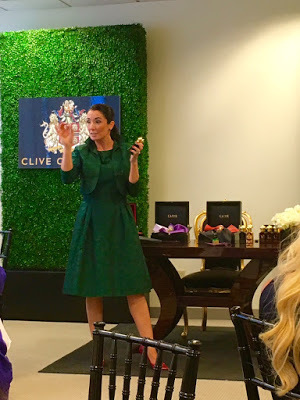 I was first introduced to the Clive Christian fragrances, by his daughter Victoria Christian many years ago. To this day the process, reminds me of my olfactory innocence. The fragrances weren’t like anything else I had inhaled or anything else on the market. Unlike the fad fragrances that are fashionable for a season, there is a longevity to these fragrances, and that’s because you have to love them to wear them. 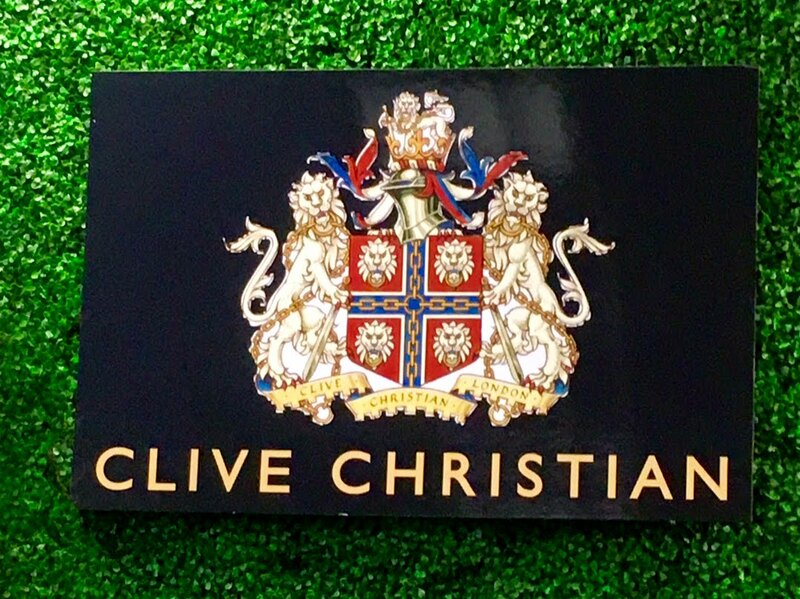 You’ll never just “make do” with a Clive Christian fragrance because like a great love, they’re to be admired, pursued and cherished. If you’re looking for instant gratification these fragrances are not for you. As with all absolute perfumes, wearing them means embarking on a journey, one without a compass (or a GPS) not knowing where the final destination will be. It’s best to spritz the fragrance on your skin without rubbing it, so as to not bruise it, and then allow it to settle. The next step is to do nothing. You have to be patient, and give it time to develop. One spritz or a drop is all you need and depending on your body chemistry and your environment, each layer that’s unveiled will hold a language of its own, that’s unique, to you. Unlike many fragrances on the market, these fragrances are not going to reveal themselves to you immediately, like a fine wine that’s sipped slowly, enjoy them sparingly. They’re also worth the wait, because once you’ve discovered your match, it’s unlikely, you’ll stray. It’s also rare to find anyone else wearing them, which is a novelty I like, and if you do, it feels like a secret shared, between friends and connoisseurs. The Crown Perfumery, first established in 1872, has a rich history, which is why it appealed to Clive Christian when he decided to purchase and revive it in 1999. Queen Victoria had given her seal of approval to the company. And now, another Victoria, the daughter of Clive Christian, along with her father at its helm, are taking it forward, into a new era. edition; 1872 with a twist of Mandarin, which is sublime. over the last 10 years? perfumes that they are still enjoyed by so many across the country! to me similar to when sunbeams land on your face it is so bright and delightful! A display of some of the Clive Christian perfume collection, for men and women. and being the only sibling in the business? Elizabeth II for his contribution to British luxury. 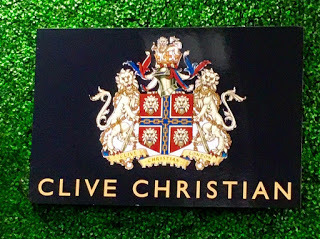 The Clive Christian coat of arms awarded to him in 1999 by The Royal College of Arms. He was appointed Officer of the Order of the British Empire (OBE) in 2012. SA: Tell me about your first fragrance memory? of those roses for every single drop. The 1872 perfume spray for women a floral, fruity, citrus fragrance perfect for summer days and nights. (100ml $495). 1872 is the year The Crown Perfumery was established. in the world? And if so why? Victoria Christian hosts a private reception at NM Fashion Island. tell me about that and how it has influenced your brand. brings a third element to the perfumes – rather like two wings of a butterfly. 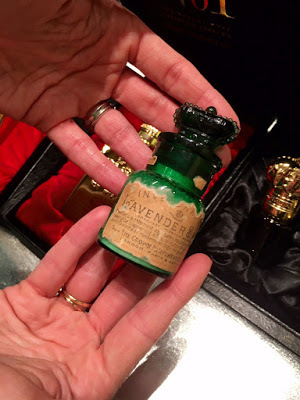 A sealed original bottle of lavender salts from The Crown Perfumery from 1800’s which has inspired the current perfume bottles. The Crown Perfumery was the perfume available on the first class cabins of the Titanic. of her crown! Nothing better than feeling like Royalty! 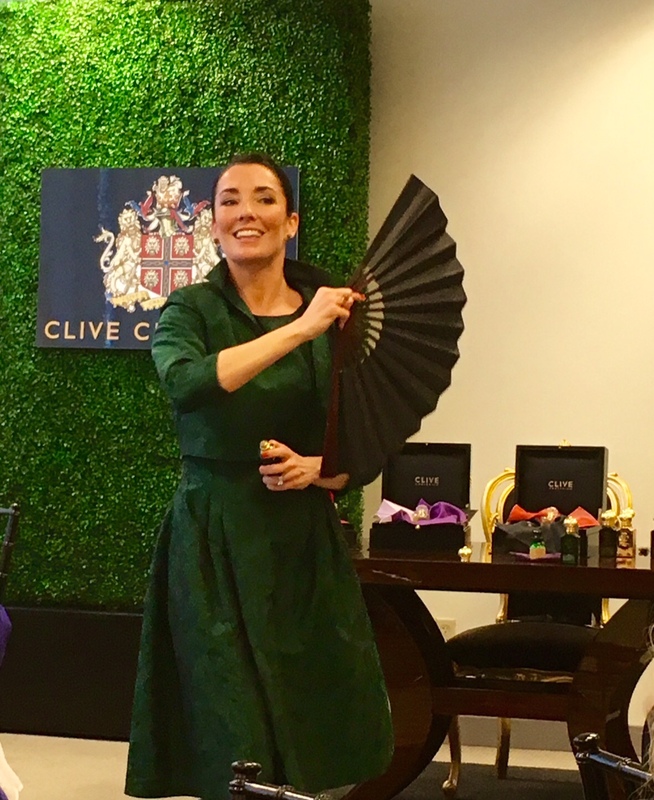 Victoria uses a fan to introduce each fragrance as was the custom in Victorian England. do you like to wear when you’re not at work? holds a very special memory of the most wonderful day of my life! 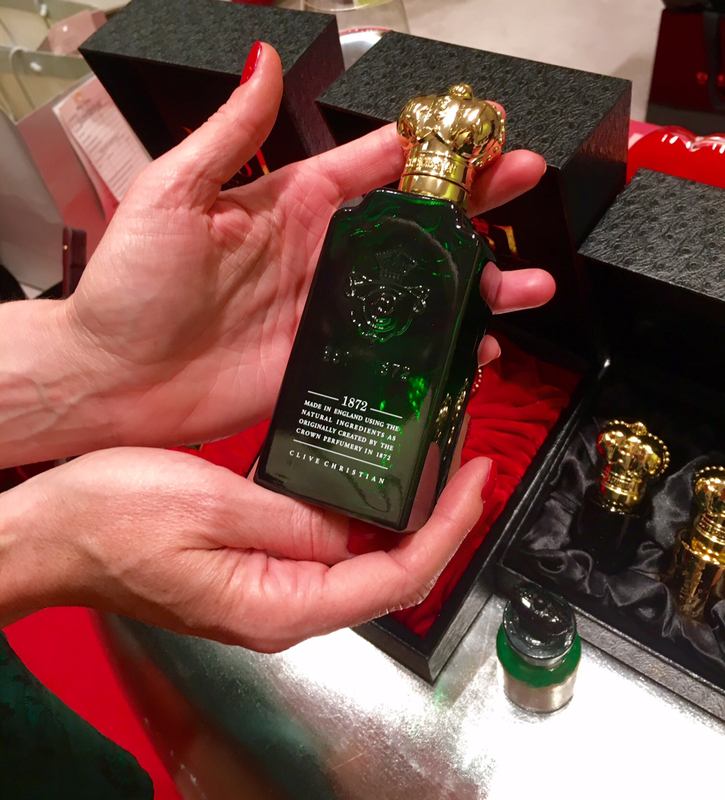 Victoria talks to me about the soon to be launched limited edition 1872 with a twist of Mandarin and 1872 with a twist of Vetiver. and what are you telling us here at Neiman Marcus Fashion Island? the feeling of Californian sunshine! Victoria and I after the presentation. 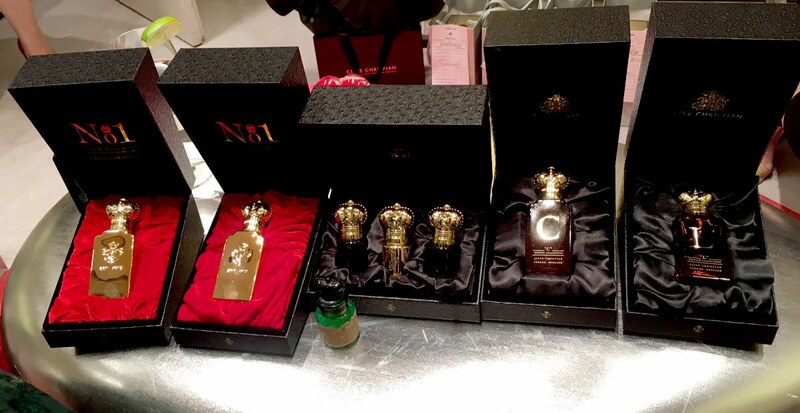 Also seen here is a bottle of the Nº1 perfume. Clive Christian was also commissioned to create a unique presentation of a matched pair of the Nº1 perfumes, a his and hers for Prince William and Katherine (Duchess of Cambridge) for their wedding. Their perfume bottles were hand-cut crystal with a brilliant-cut diamond solitaire embedded in them, and their initials etched in gold. A gift fit for royalty. 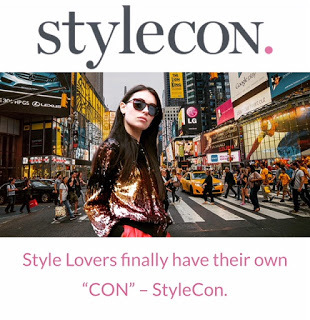 Filed Under: Uncategorized Tagged With: Fashion Island, Joshua Tree Collection, Mermaid Bowl, Michael Aram, Neiman Marcus, Palm Collection. Tom Ford Lipstick in Scarlet Rouge $52 (www.neimanarcus.com), Smythson notebook $60 (www.symthson.com) scenic view of Rajasthan (www.rajasthantourism.gov.in), Lucio Fontana’s white slashes (www.sothebys.com). What are some of the items I would find inside your handbag? Three different currencies in cash since I am always traveling, my Tom Ford sunglasses, two iPhones (one for Colombia and one for the U.S.), a Smythson notebook that says “Smile” on the outside for sketches and notes and a Tom Ford lipstick in Scarlet Rouge. What handbag do you like to carry on a daily basis? 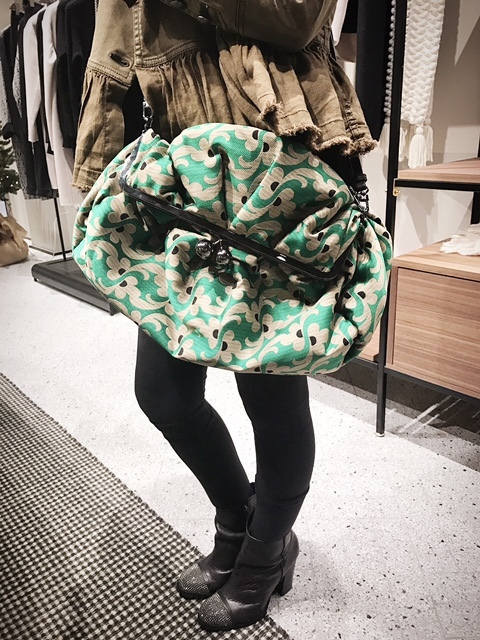 For everyday I love wearing my convertible tote in Kelly green as it fits my entire life. 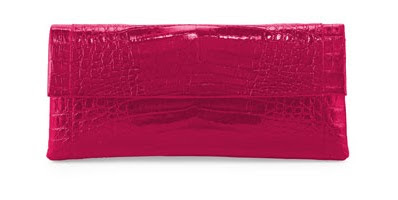 I always keep a Gotham clutch in a surprising neutral such as electric blue or fuchsia packed (I use it as a wallet), in case I need to go out. That way I am ready for any kind of event. You’re known for your use of exotic skins and bright colors, what’s your favorite exotic skin and color combination right now? 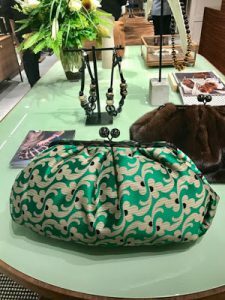 My favorite precious skin is crocodile, and my favorite bag from this season is the double chain shoulder in black crocodile, with white crocodile poppy flowers on the flap with a hint of bordeaux in the bud of the flower. Since fashion is inspired so much from artists can you tell me about your favorite artist? Lucio Fontana’s, white slash paintings. I need visual silence in the art I collect. What are we going to see next season from you? 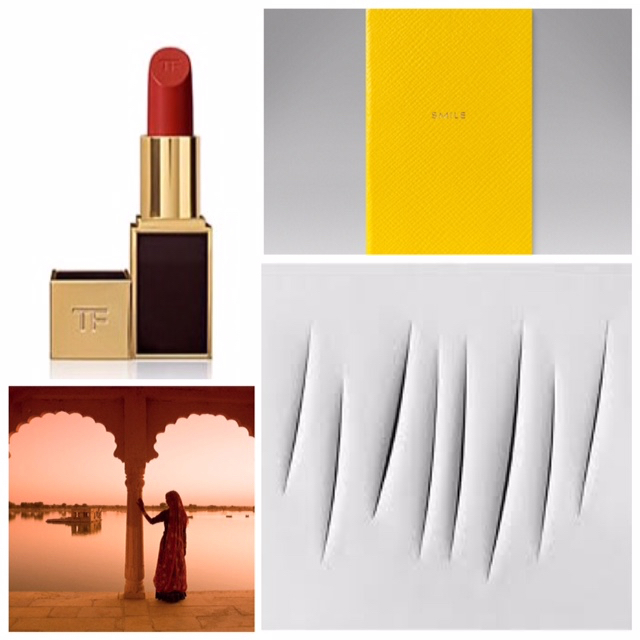 For Resort 2016 you will see the story of Rajasthan. This is by far the most exuberant collection I have ever created. From jewelry adornment made entirely out of crocodile, to horse hair woven with real silver, to crocodile flowers, this collection is truly a feast for the eyes. Where do you get your inspirations from and do you feel something specific inspires you each season? In Colombia, we have blue skies, three hundred and sixty-five days a year, the largest number of bird species in the world, and an array of greens that is incredible. Even after all these years, nature is still my best collaborator and life is my source of inspiration. Nancy Gonzalez handbags are available at Neiman Marcus, Fashion Island.